for us to be featured in this magazine! 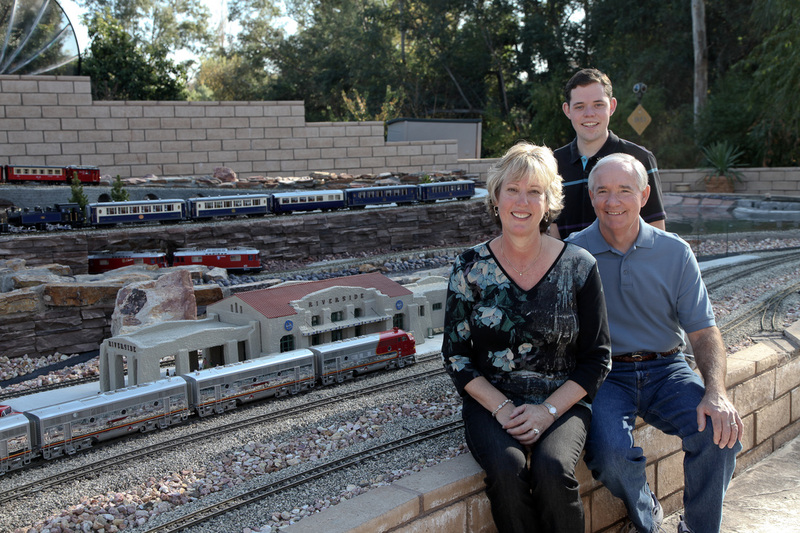 The MANNM (Mike, Ann, Michael) Railroad has been a work in progress for many years. The concept of our own backyard railway started in 2003, but it was not until 2006 that construction began. Today, the layout is nearing completion. All of the heavy construction and masonry work is finished; more plants, lighting, and buildings are in the works for the future. There are many progress pictures in the links below and I hope that some of these pictures will help anyone who is building their own railway. The layout is designed as a "wedding cake" where no two tracks are on the same tier of the cake. We have six tracks (so six tiers) that cross over and under each other, a rack railway that weaves its way through the layout, and a point to point line. Three waterfalls feed 130' of stream beds into two collecting ponds. All but two of the tracks run inside the stream beds. The plan was to make the railroad so that you would never see one train the whole time because it would run under or behind another train track. One moment you might see no trains running, and the next there will be seven trains in view. The observer will see something completely different from every angle. Another important aspect of the railroad is that even if there are no trains running, there will still be plenty to look at. 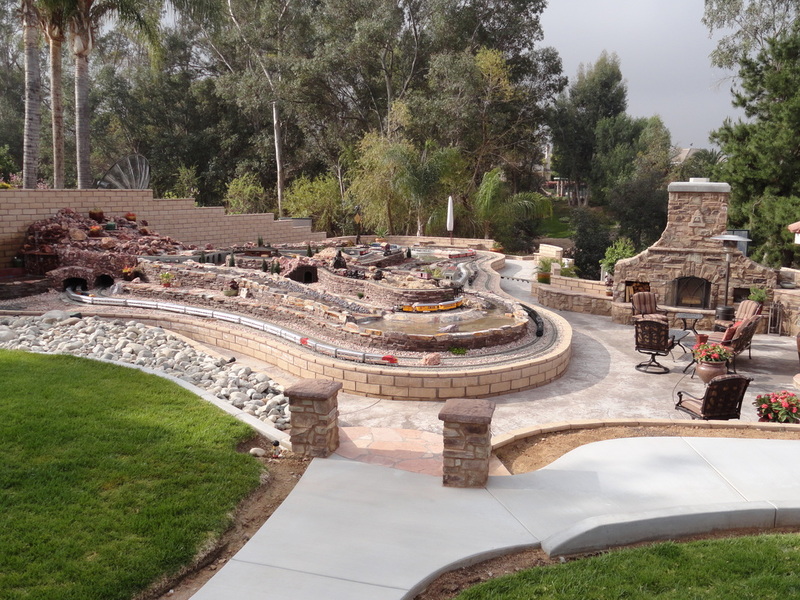 The running water travels through an array of colored rock and rolling terrain. It was important that the trains not overwhelm the area. This may seem a little strange at first considering it is a "train" layout. However, I wanted the viewer to see a beautiful area with plants and running water, that just so happened to have trains passing through it. A lot of time was spent on the design of the railroad and every track was carefully positioned to get the desired affect. There is no particular theme to the railroad because we like to run trains that we like, without being restricted to a specific era. We have everything from American logging with the Shay line to a European section with the Rack railway, Orient Express and RhB trains. Main lines one and two have large sweeping curves and over 180' each of track so we can run almost anything. We have even included history from hometown Riverside including the rain cross, Mt. Rubidoux, and the historic Riverside Santa Fe station. I am very proud to see this layout from design to where it is today. 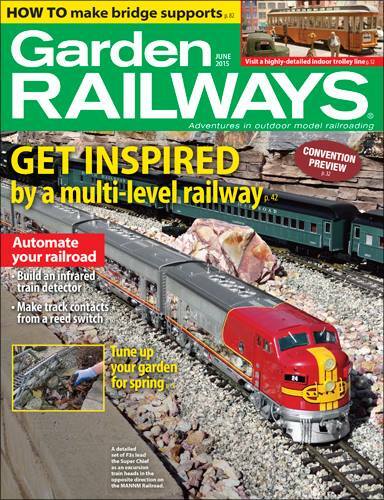 I hope that some of the ideas displayed here will inspire your very own garden railroad.